Christmas is a very special time of the year. Families, friends, work/ business colleagues, neighbours and loved ones come together to share quality time through dining, exchanging gifts and having fun . In this special season, Hilltop Aid has decided to share happiness with people in need. These are people who are going through difficult times. HIGHLIGHTS OF EVENT: FREE THREE COURSE MEAL, MUSIC, GIFTS, GAMES, AND PRIZES TO BE WON. 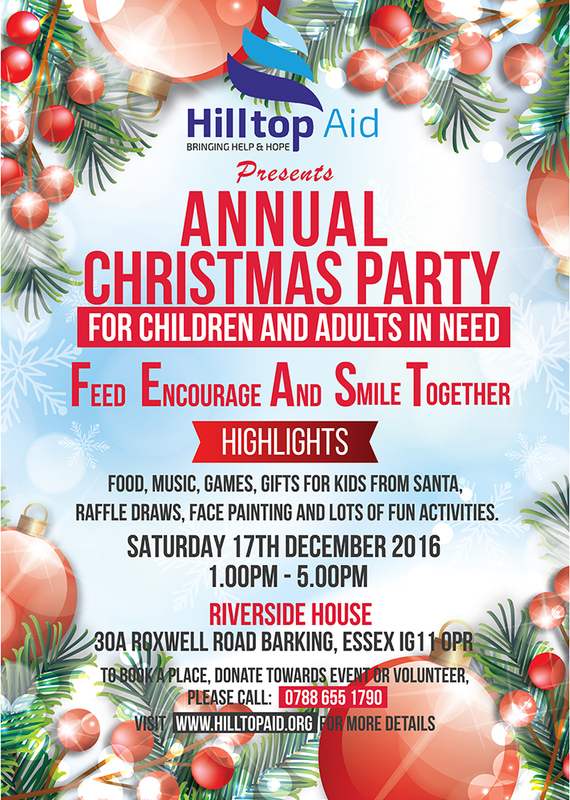 This invitation is open to low income families, homeless people, single parents and all those that are in need at this special time of the year. Come and experience the true meaning of Christmas. 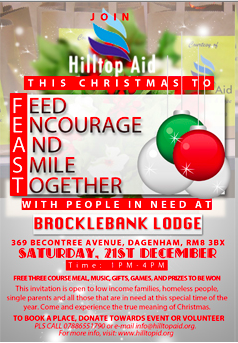 THIS EVENT IS PARTLY SPONSORED BY SAINSBURYS(chadwell Heath store) AND SUPPORTED BY BARKING & DAGENAHM HOSTEL SERVICES.